Pequam, however, is most noted as an expert litter tracker. On a good day, Pequam can track litter 15 to 20 feet (4.572 to 6.096 metres). As a side note, Pequam prefurs the metric system. Pequam’s goal is to become top-rated in the biathalon, even though he has never seen snow, or used a gun (he can scratch and bite, however…). Pequam has experienced many traumatic events in his young life. The first was when he as stung in the nose by a spelling bee. Pequam’s next trauma occurred when he fell on a curling course (during the Olympics…) and was nearly wacked by a broom. 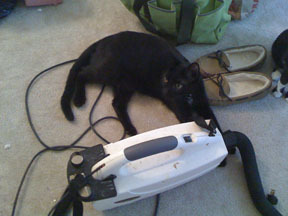 After close call with a broom, Pequam developed an affinity for a particular portable vacuum. Pequam's parents, Martin and Martes Pennanti, were from the old country, where they scratched out a living driving race-ready Zambonis. Pequam migrated here from his home country of Forest Borealis after discovering pekans. Interestingly, pekans was also the inspiration for his first and last name.